UNITED NATIONS, Jul 9 2015 (IPS) - Barely 10 months ago, the United Nations Refugee Agency (UNHCR) said the refugee population from Syria had reached the three million mark. Today, the latest data from the field show that the number has passed four million. “This is the biggest refugee population from a single conflict in a generation,” U.N. High Commissioner for Refugees António Guterres said in a statement on Jul. 9. Midway through its fifth year, the Syrian conflict that began in March 2011 has reached catastrophic heights, and yet shows no sign of abating. What started out as mass demonstrations against long-time ruler Bashar al-Assad now involves multiple armed groups including fighters from the Islamic State in Iraq and Syria (ISIS). A quarter of a million people are dead, according to estimates by the Syrian Observatory for Human Rights. A further 840,000 are injured, with many thousands maimed for life. And as U.N. agencies struggle to cobble together the funds needed to heal, house and feed millions who have fled bullet-ridden towns and demolished cities, the exodus just keeps growing. A UNHCR press release issued Thursday said Turkey is hosting 1.8 million Syrians, more than any other nation in the region. Over 250,000 of these refugees are living in 23 camps established and maintained by the Turkish government. Other countries in the region that have opened their doors to scores of families fleeing the fighting include Lebanon (currently home to over 1.7 million Syrians), Jordan (hosting 629,000 refugees), Iraq (249,000) and Egypt (132,000). In every single one of these countries, health and infrastructure facilities are quickly nearing breaking point as the hungry, sick and wounded arrive in droves. On Jul. 9 Doctors Without Borders (MSF) warned that Jordanian hospitals are groaning under a huge patient burden, including numerous Syrians injured by barrel bombs. In the last two weeks alone more than 65 war-wounded patients turned up at the emergency room of Al-Ramtha hospital in northern Jordan – less than three miles from the Syrian border – where MSF teams have been working with the Jordanian Ministry of Health to provide emergency care to refugees. The medical humanitarian organisation has called repeatedly for an end to the use of these deadly, improvised weapons, which are typically constructed from oil drums, gas cylinders or water tanks filled with explosives and locally-sourced scrap metals dropped from high-altitude helicopters. Due to the wide impact radius of barrel bomb attacks, victim often suffer wounds that are impossible to treat within Syria’s borders, where many health facilities have been reduced to rubble in the past five years. “More than 70 percent of the wounded we receive suffer from blast injuries, and their multiple wounds tell their stories,” Renate Sinke, project coordinator of MSF’s emergency surgical programme in Ramtha, said in the statement released Thursday. One of the patients at Al-Ramtha Hospital, the father of a 27-day-old child who suffered head injuries as a result of shrapnel from a barrel bomb, recounted his family’s plight, which mirrors the experience of millions of civilians caught in the crossfire of the deadly conflict. “At 9:00 a.m., a barrel bomb hit our house in Tafas […]. When I heard the news, I dropped what I was doing and I ran to the house as fast as I could […]. I saw my little boy. He was quiet and his head seemed to be injured. I took him to the field hospital in Tafas. 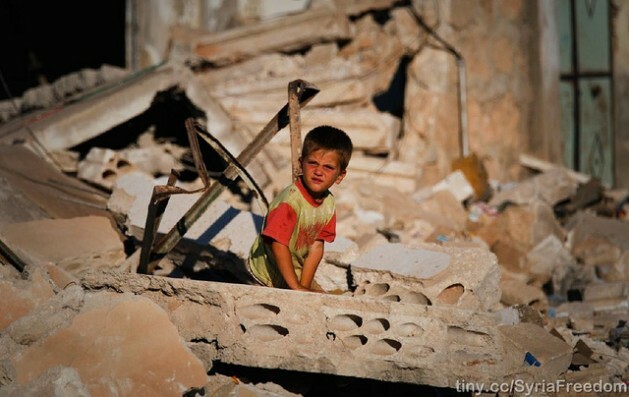 They tried to help him but couldn’t, since the appropriate equipment is not available in Syria. He needed to go to Jordan for treatment,” Murad, the boy’s father, told MSF staff. It is families like these that comprise the bulk of Syrian refugees, the highest recorded since 1992 when Afghan refugees reached an estimated 4.6 million, says the U.N. Refugee Agency. Indeed, the figure from Syria could well be even higher than field reports suggest, and does not include the roughly 270,000 asylum applications by Syrians in Europe. A further 7.2 million people are displaced inside Syria itself, in remote or heavily embattled regions. Worse, officials say, is the apparently inverse relationship between emergency needs and humanitarian funding: with the former constantly rising, while the latter shrinks. UNHCR and its partners had requested 5.5 billion dollars for relief operations in 2015, but so far only a quarter of those funds have been received. The World Food Programme (WFP), tasked with feeding about six million Syrians inside the country and in the surrounding region, is facing a massive shortfall, and warned last week that unless immediate funding became available, half a million people could starve. There is also the very real possibility that over 1.7 million people will have to face the coming winter months without fuel or shelter. As aid supplies dwindle, desperate and impoverished families are sending their children out to earn a living – according to a joint report released this week by the United Nations Children’s Fund (UNICEF) and Save the Children, three quarters of all refugee households surveyed reported that children have become breadwinners. Against the backdrop of soaring poverty rates, these findings are perhaps not unexpected. An estimated 86 percent of refugees outside of camps in Jordan, for instance, live below the poverty line, while a further 55 percent of refugees in Lebanon are living in “sub-standard” shelters, according to the refugee agency. While world leaders oscillate between political and military solutions to the crisis, Syrians are faced with a choice: death by shrapnel at home or death by starvation abroad?